Smart advertising ideas: How to reach your target group using printed mugs. Are you targeting employees and corporate business places? Mugs which will be used in corporate settings are usually going to be different for a number of reasons: Larger printed mugs are more useful to corporate workplaces given their size and durability. They are great for soups and bigger sized coffees to help employees get through the long work-days. Also, Mugs used in corporate settings are typically a standard and durable mug style built for long-term use, and do not need to be of any voguish style. Furthermore, larger printed mugs are attractive to companies because they offer more advertisement space for large company logos. Are you specifically targeting homes or employees in less corporate workplace settings? Then you may prefer to choose a modern style coffee mug design which will be attractive to home-makers, or for boutique workplaces. There is an extensive variety of quality porcelain mug designs to choose from when you are targeting a non-corporate group. No matter who the target groups is, printed travel mugs are an excellent gift for all people. For traveling workers, printed travel mugs are a useful item which can potentially advertise your logo outside the office in various places, for example: whilst on public transport, meeting with clients and other employees in meetings, or even in various social settings outside work hours like sporting events. Travel mugs are also an excellent choice for students. Needing to take their coffees and hot drinks in and out of lectures all day makes printed travel mugs an ideal gift choice for this group. Regardless of the target group, the transportability of a printed stainless steel travel mug means that the advertisement will travel with the person, having a wide scope for advertising in both private and public settings. If you are wanting to promote your business name or company logo to members of a club, then printed glass mugs may be the best choice. Glass mugs are used in many pubs and clubs for beer, wine, spirits, and other alcoholic and non-alcoholic drinks. Printed wine glasses make an excellent promotional merchandise item for this specific target group also. 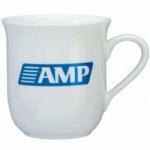 As you can see, using printed mugs is a great way to advertise your company name or logo in various settings. Choosing the right style mug to suit the social group or setting you are wishing to target will further increase the advertising potential of this universally accepted promotional merchandise item. Large durable printed coffee mugs not only make an indispensable workplace gift but can often end up as a /useful/loved household item. In the home they are great for the same reasons mentioned above, as usually the average mug sets used in homes will be standard medium sizes, and less-durable too, making it a long-term favorite mug amongst family members for bigger drinks and soups. Giving promotional mugs to employees, mugs can be taken home and used, therefore can reach homes, not only the office.